Contractors that contemplate bidding on $50 million or higher contracts must submit a CAS Disclosure Statement prior to award. Yesterday we described the Government's "administrative" processes related to Disclosure Statements that have been submitted. First there is the "adequacy" determination and secondly, the "compliance" determination. If you missed that post, click here to read. Today we want to focus on the specific factors that the Government uses to determine whether a Disclosure Statement is adequate. It is important to note that the ACO (Administrative Contracting Officer) is the one that actually makes the determination but it is the contract auditor that provides the basis and report for that determination. Delineating the contractors methods of distinguishing direct costs from indirect costs and the basis for allocating indirect costs to contracts. Contractors are required to complete separate Disclosure Statements for each "segment" allocating costs to Government contracts. So, for example, if a contractor has a corporate office or a home or intermediate office that allocates costs to that segment, additional Disclosure Statements are required. If a contractor tries to combine segments/home offices into a single Disclosure Statement, the auditor will reject it. Contractors are required to use the most current Disclosure Statement form. The auditors will reject any Disclosure Statement using outdated forms. The most current forms are available on OMB's website (click here). Note here that there are two Disclosure Statement forms, one for commercial companies and the other for universities. To be considered adequate, a Disclosure Statement must be current, accurate, and complete. A Disclosure Statement is current if it describes the cost accounting practices which the contractor intends to follow for estimating, accumulating, and reporting costs. A Disclosure Statement is accurate if it correctly, clearly, and distinctly describes the actual method of accounting the contractor intends to use. A Disclosure Statement is complete if it includes all significant cost accounting practices the contractor intends to use and provides enough information for the Government to fully understand the accounting system being described. Auditors will specifically be looking for vague, incomplete, or ambiguous answers which could lead to alternative accounting interpretations. This is where many disputes arise between the contractor and the auditors. If an auditor cannot determine how a particular cost will flow though the accounting system and end up on a contract, either directly or indirectly, he/she will flag it as needing further description. The auditor is usually correct here - contractors sometimes "assumes" a level of knowledge by the reader that is not warranted. Preparing current, complete, and accurate Disclosure Statements can be a daunting task for contractors preparing them for the first time. It is often cost-effective to commission outside expertise to help in the process. CAS Disclosure Statements are written descriptions of contractor cost accounting practices and procedures. In general, it is required for fully CAS covered contractors and must be completed prior to the award of a CAS covered contract of $50 million or more. You can read more about CAS Disclosure Statements requirements by clicking here. Once a CAS Disclosure Statement has been submitted, it is subject to a variety of reviews and administrative actions by the Government. Most of these are covered in FAR (Federal Acquisition Regulations) Part 30. Essentially, the Government will need to determine whether the CAS Disclosure Statement is adequately describes the contractor's cost accounting policies and procedures and whether those policies, procedures, and practices are compliant with FAR Part 31 and Cost Accounting Standards. This is usually referred to as "adequacy and compliance". According to FAR 30.202-6, the cognizant ACO (usually DCMA or Defense Contract Management Agency), is responsible for determinations of adequacy and compliance of the CAS Disclosure Statement. But, in order to make such a determination, the ACO must rely upon the consultation and advise of the contract auditor (usually DCAA or Defense Contract Audit Agency). The contract auditor conducts initial reviews of CAS Disclosure Statement to ascertain whether they are current, accurate, and complete. The auditor then reports the results of the review to the cognizant ACO. The ACO then makes a determination whether or not the Disclosure Statement adequately describes of contractor's accounting practices. It is almost unheard of that the ACO will go against the advice of the auditor if the auditor finds the Disclosure Statement adequate. On the other hand, its not uncommon for the ACO to reject the auditors opinion when the auditor finds deficiencies in the Disclosure Statement. ACOs and auditors often have different views on the significance of deficiencies. After the ACO notifies the contractor that its CAS Disclosure Statement is "adequate", the auditor then jumps back in and conducts a "detailed compliance review" to determine whether or not the disclosed practices comply with FAR Part 31 and with applicable Cost Accounting Standards (see FAR 30.202-7(b)). Noncompliances are reported back to the ACO. The ACO can take several possible actions when noncompliances are reported. The ACO may (i) require the contractor submit a revised Disclosure Statement, (ii) may require adjustments to contract prices or cost allowances, or (iii) dispose the audit report without any further action if he/she disagrees with the audit report. In the next couple of postings, we will look at specific audit steps that the auditor will perform when testing for adequacy and compliance. From time to time, Government contractors will need to make changes to their established cost accounting practices. There are many reasons for contractors to change their cost accounting practices. Perhaps they've acquired or spun-off a company, added a product line, consolidated operations, or simply want to improve the causal-beneficial relationship between indirect costs and their respective allocation bases. Anytime an accounting change occurs, there will be a cost impact to contracts. That should be fairly obvious. Sometimes the cost impact will be significant and sometimes not. ACOs (Administrative Contracting Officers) do not particularly like to see accounting changes because it means more work - they have to review and negotiate cost impact proposals and modify contracts. They will make herculean attempts to declare cost impacts resulting from accounting changes to be immaterial. That way they don't have to exacerbate their already heavy workload. Contract auditors on the other hand are highly suspicious of accounting changes. Auditors worry that accounting changes are made simply to maximize contractor profits. Sometimes auditors' worries are justified. Accounting changes have been used to shift costs from commercial work to Government contracts, from fixed price to flexibly priced contracts, and from contracts in loss positions to contracts with room in the budget. Not detrimental to the interest of the Government. CAS covered contractors are required by the CAS clause (see FAR 52.230-5) to notify the ACO and submit a description of any voluntary cost accounting practice changes not less than 60 days before implementing the change. The ACO will review the proposed change for adequacy and compliance (see FAR 30-202-7). If the description of the change meets both tests (adequacy and compliance), the ACO will notify the contractor and request a cost impact proposal. Once the cost impact proposal is received, the ACO will analyze the proposal and determine whether or not the proposed change will result in increase costs being paid by the Government. Usually, the ACO will request assistance from the contract auditor at this stage. After that analysis is completed, and if the impact is "material", the ACO will negotiate contract price adjustments on behalf of all Government agencies. Sometimes contractors do not make the required submissions - either the 60 day notification of the accounting change or the resulting cost impact proposal. This is usually not to their benefit. It allows the Government to estimate the general dollar magnitude of the cost impact and withhold money from billings. Generally, the Government will not be conservative in their general dollar magnitude estimates and contractors can experience sudden drops in their cash flows as a result. Another day, another press release from the Department of Justice announcing yet another Government contractor has paid a bucket load of dollars to settle False Claims Act Allegations. There was no admissions of guilt, mind you, nor a determination of liability - only some money changing hands to settle some allegations. In this case, the contractor settled for $10 million. It looks to us as if the charges began as defective pricing. Justice referred to "misrepresentations during contract negotiations" and "false statements to inflate the price of goods or services sold to the government". Those statements sound like the contractor did not furnish current, complete, and accurate cost or pricing data as required by the Truth in Negotiations Act. At one time, the Government had a robust program for reviewing contracts for compliance with the Truth in Negotiations Act (TINA). Those reviews (audits) have all but disappeared. In fact, DCAA has programmed only 35 staff years out of a workforce of 4,668 to perform TINA reviews. That's less than one percent. We don't know why the significant drop-off except perhaps the feeling by Agency management that there was not sufficient payback on those kinds of audits. The Government approaches TINA violations (i.e. failure to furnish current, complete, and accurate cost or pricing data during negotiations) as potential referrals for violations of the False Claims Act. In fact, every "positive" defective pricing audit report had to be either referred for investigation or a written justification as to why the auditor did not believe a referral was warranted had to be prepared. It is, of course, easier to refer a defective pricing finding for investigation than it is to write up justification as to why it should not be referred and have that judgment questioned by supervision and management up the line. The DoJ press release did not state the manner in which this alleged False Claims Act violation came to their attention. It could have been a contract auditor, a contracting officer, or perhaps a whistle-blower. Whatever manner, contractors should be aware that there is a panoply of Government oversight activities just doing their jobs and internal whistle-blowers looking to strike it rich. Last December, the President signed into law the Bipartisan Budget Act (BBA). Among its provisions is a $487 thousand limitation on compensation for all employees on all Government contracts awarded after June 24, 2014 (click here for more details). Compensation, in this case, includes basic salary/wages, bonuses/incentive compensation, deferred compensation, and employer contributions to ESOPs and defined benefit pension plans This is different than the FAR definition of "compensation" (click here for more details). This new limitation is causing implementation issues. Any contract awarded prior to June 24, 2014 is subject to the significantly higher compensation limit provision found in FAR 31.205-6(p) For calendar year 2012, that cap is $952 thousand. The 2013 rate has not yet been published. Only contracts awarded after that date, are subject to the lower compensation cap. This means that for a time, contractors will be working on contracts subject to differing compensation ceilings. Many contractors will have contracts subject to both the current and earlier compensation limit provisions in (FAR), causing the potential for undue complexity and related costs to implement multiple rates to accommodate these revisions. After careful review and consideration of the law and regulations, contractors' use of a "blended rate" approach is deemed as a practical and cost efficient solution to implement these requirements. Blended rates will be calculated by each individual contractor as a weighted average composite cap amount specific to their contract volume prior to June 24, 2014, and on or after June 24, 2014. ...for the purpose of establishing final overhead rates, contractors will calculate blended rates reflecting actual proportion of contract costs for the current year for contracts prior to and after June 24, 2014. The contractors' final overhead submission for the completed fiscal year must include auditable substantiation of the calculation of the actual blended rates. An audit will ensure that only the total allowable compensation is billed to the Government for the fiscal year based on the different authorized caps. The objective is to simplify compliance while continuing to protect the interests of the Government. Contractors who chose to use blended rates, will need to execute advance agreements with their contracting officers. The advance agreement will outline the agreed-to-process, auditable data submission and expiration for the application of the blended rate. DCMA (Defense Contract Management Agency) will be issuing implementation guidance at some unspecified date. Contractors who are impacted by the lower compensation cap in 2014 should be thinking about how to develop blended rates now and begin to engage their contracting officers. Don't wait for DCMA guidance because that might not happen quickly. Get outside help, if necessary. This new policy is from DoD and applies only to DoD contracts. We have not yet heard how other Agencies will implement the $487 thousand annual compensation cost limit. However, contractors could certainly make a good case for applying the DoD methodology to non-DoD contracts. We often refer to "Permanent Files" or "Perm Files" in our postings. We did it again just yesterday and then someone wrote us and asked what we meant by permanent files. Most, if not all audit organizations, have permanent files. These are central repositories of information gathered during audits that has continuing value and use to subsequent audits expected to be performed at the same contractor. Permanent files are useful for auditors in assessing risk, preparing audit programs and in determining the appropriate scope of subsequent audits. They also provide ready means for auditors to become familiar with the contractor's operations and any existing audit problems or contractor system weaknesses. While summary information on the contractor's organization, financial structure, and policies and procedures may sometimes be included in permanent files for smaller contractors, such information on large contractors with continuing audit activity is generally maintained in a central reference library. Most likely, permanent files are electronic. Accounting methods that influence the nature, level, and accounting treatment of costs being charged to Government contract. Internal control questionnaires (Most contractors have been requested to complete these at one time or another). Mandatory Annual Audit Requirement (MAARs) Control Logs. There is nothing mysterious about permanent files. It is simply a term used to describe a collection of information and data that may be useful to some auditor, someday. Audit files (as opposed to permanent files) are eventually archived to Federal Records Centers for a few years, then destroyed according to Government records retention policies. Permanent files are not archived nor do they represent official records. Auditors responsible for maintaining permanent files use their judgment as to what information is added and what can be destroyed. This is the fourth and final installment in our series on the new procedures for performing audit oversight of contractor billings under cost-type contracts. Until 2012, DCAA (Defense Contract Audit Agency) reviewed and approved all public vouchers (i.e. billings submitted for reimbursement of costs under cost-type contracts) unless a contractor wanted to go through the laborious process of qualifying for the Direct Billing Initiative. Beginning in 2012, the Department of Defense decided that the audit process was not adding enough value for the cost involved so it made direct billing available to all contractors. In place of the requirement to review every public voucher, the Department came up with a risk assessment approach to reviewing vouchers. This entailed segregating contractors into high risk and low risk categories according to the criteria we discussed in an earlier post on this subject. For low risk contractors, a "sampling" table is loaded up into the WAWF (Wide Area Workflow) system and the system automatically selects a few vouchers for audit review. The system also identifies vouchers that are significantly above the norm and selects those for audit as well. For example, if a contractor has been submitting monthly vouchers for a contract in the $100 - $200 thousand range and all of a sudden submits one for $1 million, the system would probably flag it and send it over to the auditors for a look-see. Reported accounting or billing system deficiencies. Audit leads or other significant risk factors identified in the permanent files within the past two years. Improper payments identified in previous reviews of public vouchers. Significant number of previously rejected public vouchers attributable to a situation that has not been fixed (e.g. a certain contractor employee that makes lots of mistakes). After completing the risk assessment, the auditor must then devise a sampling plan. If there are no identified risk factors, the auditor could, presumably, rely on the table used for low-risk contractors. If there are identifiable risk factors, the auditor will need to sample more vouchers than would be required for low-risk contractors. Contractors should know when one of their public vouchers have been selected for review because one of the review steps requires the auditor to trace the amount claimed back to the contractors accounting records. Unless they have on-line access to the job cost ledgers, the auditors will be knocking at the door. It is very important for contractors to accommodate auditor requests to trace billings back to accounting records very quickly. As we mentioned before, the auditors have only five days to perform their voucher reviews. If contractors don't make time available within these five days to accommodate this comparison, the auditor will, in all likelihood, reject the billing. Then it becomes necessary to resubmit the voucher and that will unnecessarily extend the time it takes to receive payment. The text of the revised procedures can be read or downloaded here. This is the third in our series on the new policies and procedures brought about when DoD eliminated the need for contractors to obtain DCAA's (Defense Contract Audit Agency) provisional approval of billings before they could be submitted for payment. This change occurred in 2012, was long overdue, and there were many both inside and outside of DCAA who questioned whether the audit agency was providing any real value to the process. Under cost-reimbursable contracts, all costs are subject to final audit so the only risk to the Government was the time-value of money on possible overpayments. It was "interesting" and sometimes humorous to watch auditors quibble over a point or two on a provisional indirect billing rate as if they had better insight than the contractor as to what the final rate would be for the year. It was also frustrating as well because billings were sometimes held up pending resolution/agreement of those provisional billing rates. Even though DCAA has been taken out of the billing loop, so to speak, there is still a need for audit oversight. DCAA has devised a risk-based approach to rendering that oversight. Essentially, it divides contractors into high-risk/low-risk. High risk contractors are those that bill for more than $250 million per year and those that have had questioned costs in previous incurred cost audits (those questioned costs must meet certain percentage thresholds as we explained yesterday). Billings from low-risk contractors are randomly selected for a pre-payment review. For high-risk contractors, billings are also sampled but the process is a bit more complex and there will probably be more billings (percentage-wise) selected at high-risk than at low-risk contractors. Does the voucher have the correct contract number and CAGE code? Do the contract number, voucher number, and dollar amount on the voucher agree with the attached supporting documentation? Are billed costs with the period of performance? Does the voucher include current and cumulative billed amounts? Does the Contracting Officer or the Contracting Officer's representative have any specific concerns related to the contract or voucher? Are costs/fee billed in accordance with contract provisions? Did the contractor use appropriate billing rates? Do the current and cumulative billed costs reconcile to the contractor's accounting records? If the voucher contains significant subcontract or supplies and service costs, are they in accordance with the requirement that the be paid within the terms and conditions of the subcontract or invoice (normally within 30 days)? Are the fees and costs claimed within the contract funded and/or ceiling amounts? From the preceding listing, you can see that there is only one step that involves the contractor; Do costs reconcile to the contractor's accounting records. Everything else should be on-file in the audit office, including a provisional billing rate approval letter. So that's the substance of the auditors' reviews. Contractors with a single contract that bill monthly can expect one of its public vouchers to be reviewed under this new procedures. That could add up to five days from the time the voucher is submitted to the time it is paid. However, it is also likely that it will not add any time to the process because the five day audit cycle is normally built into the 30 day period in which the Government must pay. If you missed Part 1, read it here first. As we introduced yesterday, the revised DFARS (DoD FAR Supplement) section 243.803 requires the contract auditor to institute a risk-based approach to reviewing public vouchers (also commonly referred to as "interim vouchers", "requests for reimbursement", "requests for payment", or simply "billings"). That means that the auditor must determine "risk" and then make a selection of vouchers based on that risk assessment. DCAA (Defense Contract Audit Agency), has made the determination very easy. Contractors with ADV (Annual Dollar Volume) of more than $250 million are high risk. Those with less than $250 million of ADV are low risk unless there were certain threshold questioned costs in prior incurred cost audits. We described those questioned cost thresholds in a previous positing (click here to read it). Those thresholds . ADV represents the total costs incurred on flexibly priced contracts (e.g. CPFF, CPIF, FPI, T&M, etc) during a given year. We will discuss the sampling plan for high-risk contractors in a later posting. 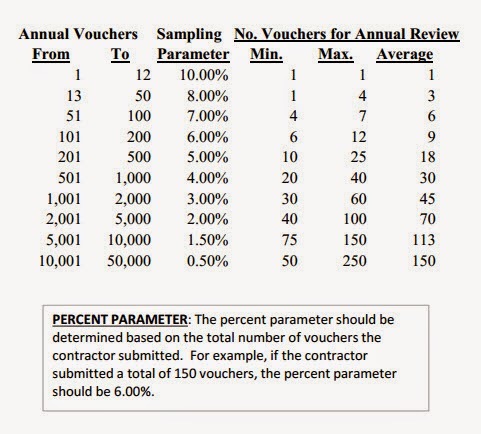 For low-risk contractors, the number of vouchers to be reviewed each year is based on the number of vouchers submitted year according to the following table. For example, a contractor with a single cost-reimbursable contract submitting a monthly voucher can expect to have one voucher pulled for pre-screening. For high-risk contractors, DCAA has developed a "risk determination tool". We will discuss that tool in tomorrow's posting. Back in August 2012, DFARS (DoD FAR Supplement) was revised to eliminate the "Direct Billing Initiative". The Direct Billing Initiative was a program that allowed contractors to submit their public vouchers (i.e. cost reimbursement vouchers) directly to the paying office without having to go though the process of having DCAA (Defense Contract Audit Agency) review and approve the vouchers before payment. The idea was sound policy - if contractors had adequate billing systems, regularly updated their indirect billing rates, and were timely in submitting their annual incurred cost submissions, they could be approved for direct billing, thereby shaving a few days off of number of days it took to get paid. The concept was great but the implementation was horrible. DCAA set an extremely high bar for approving contractors for direct billing. Perhaps they didn't want to see their work volume diminish. For smaller contractors, the bar was insurmountable because their size didn't allow them resources to develop the strong internal control systems demanded by the contract auditors. For other contractors, the additional cost of getting their payments two to five days earlier than normal, was not worth the cost of haggling with the auditors. Finally, DoD had enough and heard enough contractor complaints so they killed the Direct Billing program entirely. In its place, they authorized every contractor to bill directly - effectively by-passing the auditor. To protect the Government's interests however, DoD included a provision that allowed for a risk-based sampling process. They idea here is that a risk-based sampling process would be a more effective and efficient approach to validating billings by allowing for the evaluation of selected vouchers on a pre-payment basis. Under the new rule, auditors would need to assess the risk of overbilling and then select a few billings for further review prior to payment. The sampling would be performed within the WAWF (Wide-Area-Workflow) billing system. Contract auditors would go into the WAWF system and intercept vouchers for review prior to their being paid. Now, more than two years later, DCAA has come up with their new billing oversight plan that corresponds to the new DoD policy. (We're not sure what they were doing in the intervening two years). Essentially, the new procedures requires a determination of whether contractors are considered high-risk or low-risk and a sampling plan that corresponds to that determination. Over the next few days, we will be diving into more of the details of that plan and what contractors can expect when their billings are selected for pre-payment reviews. New Limitations on Reimbursing Travelers for "Incidental Expenses"
In yesterday's blog, we reported that the Department of Defense is proposing new limitations on per diem for continuous travel over 30 days and additional limitations on per diem for trips over 180 days. Although contractors might want to consider something like that in their own travel policies and procedures, they would not be bound by such a policy. FAR 31.205-46 provides otherwise. After we published that article, we were alerted to a change that DoD has already made related to the reimbursement of "incidental expenses" It became effective October 1st of this year. In this change, DoD has expanded the definition of "incidental expenses" to include other items that were previously reimbursed separately. In an effort to simplify policy, align with industry practices, and reduce travel costs for the Department, the Incidental Expense policy in Appendix A of the Joint Travel Regulations (JTR) will be revised to expand the definition of incidental expenses to include various miscellaneous reimbursable expenses including CONUS laundry, baggage tips, and ATM fees. As of October 1, 2014, these expenses will now be covered under the incidental expense portion of per diem ... and will no longer be reimbursed as separate miscellaneous expenses. So, does the new policy apply to Government contractors? Yes, it does but only for travel to Alaska, Hawaii, and outlying ares of the United States. We'll explain. According to FAR 31.205-46(a)(2), Government contractors are limited to the per diem rates listed in the FTRs (Federal Travel Regulations) for travel in the continental United States, the JTRs (Joint Travel Regulations) for travel in Alaska, Hawaii, and the outlying areas of the United States, and the State Department's Standardized Regulations for foreign travel. Already, the definitions of incidental expenses between the FTR and the JTR were different. You can read more about those differences here. Now, the definitions in the FTRs and the JTRs are diverging even further. This new DoD policy affects only the JTRs at this point - that is travel to Alaska, Hawaii, and outlying ares of the United States. It does not affect travel within the continental United States. Contractors, to the extent their employees travel to Alaska and Hawaii, must take care to adhere to the new definition of "incidental expenses". Will DoD's Proposed Travel Reimbursement Policy Impact Contractors? The Department of Defense, in an effort to control rising travel costs, has proposed reductions in its per diem rate policies. Since travel costs under FAR are tied in to the GSA per diem rate schedules, contractors are wondering whether the proposal, if implemented, will impact them. DoD is proposing that employees on Government travel to one location for more than 30 days receive a flat per diem rate. For each day after 30 days up until 180 days, employees would receive 75 percent of the locality rate. The locality rate includes lodging, meals, and incidental expenses. For travel in excess of 180 days, employees would be reimbursed a flat rate of 55 percent of the locality rate. The short answer is 'no, contractors would not be bound by this new policy. However that does not mean that some auditor, somewhere, might latch on to this policy as a test of reasonableness. The FAR limitations on travel expenses applies only to the maximum per diem rates, the definitions of lodging, means, and incidental expenses, and the regulatory coverage dealing with special or unusual situations (see FAR 31.205-46(a)(4). Nothing else in the Federal Travel Regulations (FTRs) applies to contracts or contractors (except where they have been specifically incorporated into a contract, as the Department of Energy likes to do). Within those constraints, contractors are free to implement travel policies and procedures that make business sense. However, contractors are still bound by "reasonableness" criteria. So for example, FAR 31.205-46(a)(4) states that the maximum per diem rates generally would not constitute a reasonable daily charge when no lodging costs are incurred and/or on partial travel days (e.g. day of departure and return). That means whatever policies and procedures are developed, they must recognize reduced rates in some cases. What are the Boards of Contract Appeals? Often in these blog pages we have mentioned the Armed Services Board of Contract Appeals (ASBCA) and we frequently discuss their decisions and the impact those decisions have on contractors and Government contracts. The ASBCA is a neutral, independent forum which has been in existence for over fifty years. Its primary function is to hear and decide post-award contract disputes between Government contractors and DoD, NASA, and other agencies. The ASBCA functions under (i) the Contract Disputes Act (41 USC 7101 - 7109, (ii) its own charter, or (iii) other remedy granting provisions. Currently, the Board is comprised of 24 judges. The majority of matters on the ASBCA's docket involve appeals by contractors from Government contracting officers' final decisions or their failure to issue decisions. Most of the cases are heard in the ASBCA offices in the DC area, but sometimes the judges will travel to a location that is more convenient to the parties. Most hearings are held by a single Administrative Judge but most decisions are made by a panel of three Judges, as the ASBCA functions in a collegial manner. As a matter of judicial philosophy, the ASBCA encourages parties to attempt to negotiate a resolution of their dispute. The Board has developed a ADR (Alternative Dispute Resolution) program for that purpose. The quarterly reports of proceedings published by the ASBCA gives the appearance that the Board is falling behind in settling cases. Since June 2009, the number of docketed cases has grown each quarter from 532 to 1,066 for the quarter ended September 2014. During that quarter, 226 cases were docketed and 178 cases were disposed for a net increase for the quarter of 48 cases. Most of the 178 cases disposed were not actually decisions. Only 21 of them resulted in decisions handed down by the board; five appeals were sustained and sixteen were denied. The remaining 157 dispositions were labeled as "dismissed". Most often, dismissals result from either the contractor withdrawing its appeal or the disagreement was settled. The sources of the 226 cases docketed during the quarter are interesting. DCMA (Defense Contract Management Agency) led the way with 62 cases. The Corps of Engineers came in second at 49 cases. The Army finished a close third at 45 cases. DCMA is probably highest because that Agency is tasked for settling contractor incurred costs, executive compensation, and CAS (Cost Accounting Standards). Claims by federal employees for reimbursement of expenses incurred while on official temporary duty travel or in connection with relocation to a new duty station. Contractors have a choice when challenging a contracting officer's final decision (or a contracting officer's refusal to render a final decision). Under the Contract Disputes Act of 1978, contractors have the exclusive right to choose to litigate their claims in the United States Court of Federal Claims (CFC) or appeal to the ASBCA or CBCA. There are undoubted advantages and disadvantages to each, depending upon the issue. However, for that determination, you need to consult with legal counsel. What Do Progress Payments Have To Do With Financial Capability Assessments? The purpose of the Government's financial capability reviews of contractors and prospective contractors is to determine whether the contractor's finances are adequate to perform the contract. Financial capability reviews are performed by either a price analyst situated in one of the many procurement organizations, by DCMA (Defense Contract Management Agency) price analysts or, to a much lesser degree these days, by DCAA (Defense Contract Audit Agency) auditors. Many of the price analysts performing financial capability reviews these days are poorly trained and do not understand the nuances of cash flow projections. Most of them are not accountants and could not tell you the difference between a debit and a credit or explain the fundamental double-entry accounting equation. Yet they are reviewing and analyzing financial statements and rendering judgments on whether contractors have sufficient resources to perform whatever contract they are bidding on. Lets face it. Many small contractors have very limited financial resources. They are out scrounging for capital. They worry about meeting payroll. Their financial statements, if they even have financial statements, will not paint a rosy financial picture. Start-ups will not have any financial history upon which a financial capability determination can be based. An analyst or an auditor will have a difficult time trying to ascertain whether such companies have sufficient financial resources to perform the work. The key to understanding the sufficiency of financial resources is the cash flow forecast. A cash-flow forecast, simply put, is a schedule of incomes and expenses, detailed by source of revenue or category of expense. And here is where progress payments and cost reimbursements come it. Both progress payments (fixed price contracts) and cost reimbursements under cost-type contracts represent a form of contract financing and should enter into cash flow projections. So, for example, a contractor works for a month after which it can submit a progress payment request for the costs incurred. That progress payment is normally paid within 30 days (sometimes sooner). So a contractor needs only two to three months of working capital to perform the contract. We know of several instances where Government analysts failed to consider available contract financing in their financial capability determinations. Of course it didn't help that the contractor failed to bring it up. In one case, it was equally unhelpful that the contractor did not even know what a cash-flow forecast was or what it was for. Contractors (and prospective contractors) expecting a financial capability review should prepare a cash-flow forecast prior to the audit. There are plenty of examples on the web. It is not necessary however to spend a lot of money for a slick model. Just show on a spreadsheet, by month, here's where I'm going to get cash and here's where I'm going to need cash. If at the end of each month expenses exceed income and there is not sufficient cash in the bank to cover the deficit, contractors will need to be prepared to disclose to the auditor its plans for covering the shortfall. Last week, we reported on a settlement where a contractor had billed the Government for a certain skill level worker but used lesser-skilled individuals to perform the actual work. The contractor paid $13.5 million to settle the allegation. We have no idea of what it cost the Government to investigate - Government investigations do not come cheap and there were a lot of Agencies involved - U.S. Attorney's Office, DoJ Civil Office, DCAA, Army CID Major Procurement Fraud Unit and the Defense Criminal Investigative Service. Now comes a report on another settlement involving labor costs. In this case, the contractor was Boeing and it agreed to pay $23 million to resolve allegations that it submitted false claims for labor charges on maintenance contracts with the Air Force for the C-17 cargo plane. It is noteworthy that the claims resolved by the settlement were only allegations and there was no determination of liability. It is unclear from the Department of Justice (DoJ) press release as to the precise nature of the allegations. The only specific detail provided is that Boeing billed the Air Force for hours that it's mechanics spent at meetings not directly related to the contract. So, perhaps, the meetings related to administrative aspects of the job, or sensitivity training, or timekeeping practices, or whatever, and the time should have been charged to an indirect charge number rather than direct to the contract. The interesting thing about this case however is that it arose, not from any Governmental agency oversight, but from internal whistleblowers. Four Boeing employees filed a false claims suit on behalf of the Government (referred to as Qui Tam actions). This allows them to share in the settlement. In this case, the four individuals received $3.9 million out of the $23 million settlement (well, that would be $3.9 million less attorney's contingency fees). Presumably, but we don't know for certain, these employees first tried to resolve the issues internally but were rebuffed by management. That procedures is often a prerequisite to sharing in any recoveries. We have seen a number of Qui Tam cases in the past few years where company employees collected a share of the recoveries. This underscores the importance for contractors to have effective internal controls in place that include standards of conduct and ethical practices with oversight responsibilities and accountability. Employee concerns of wrong-doing should be investigated thoroughly and resolved timely. It takes only one disgruntled employee to make a contractor's life miserable. Beating up on DCAA (Defense Contract Audit Agency) has become somewhat passe' so the DoD-IG (Inspector General) is turning its focus on DCMA (Defense Contract Management Agency). In a recently issued report, the IG was heavily critical of DCMA's practices and procedures for reviewing contractor indirect expense rates - rates which were used to negotiate at least $70 billion in contracts. Basically, the IG's criticism involved the lack of documentation - so much so that it was unable to ascertain whether the contracting officer responsible for negotiating indirect rate agreements knew what they were doing. It was certainly not evident from the working papers (the IG calls them Contract Case Files) that the Government's interests were protected in six of the eight DCMA offices reviewed. In fact, the IG stated that the working papers were so deficient that it could not determine whether the Government (or, they should have said "taxpayers") achieved fair and reasonable pricing. This breakdown was foreseeable. First of all, DCMA has never emphasized the importance of working papers. One former contracting officer quipped that if he could not write the information down on his cuff, he didn't need it. DCAA, on the other hand, has always stressed the importance of adequately documenting in working papers the risks and the planning and the actual work performed. Bur, more importantly, the Government has always been at a disadvantage when it comes to figuring out the propriety of contractor indirect expense rate forecasts. The Government could never match the hoards of contractors' minions with insider knowledge involved in the preparation of rate forecasts. But when you remove the most important piece to understanding and attesting to the reliability of these rates (i.e. DCAA), the Agency with the expertise, the background, the continuity, the historical perspective, and the professional standing (e.g. CPAs), an awful void is left that is hard to fill. It's not that DCMA isn't trying. They've done a lot over the past few years to advance their knowledge, skills, and abilities in evaluating indirect costs and indirect expense rates (including hiring away a lot of DCAA auditors) but that is not their strong suit. They are not (generally) accountants and they do not have a propensity for understanding job costing, adjusting journal entries, or accounting accruals. Sure, they can tally up a list of numbers on a spreadsheet, but to understand the meaning of those numbers often requires someone with accounting expertise. DCAA was best suited for that job. You can read the entire IG audit report here. DCMA (Defense Contract Management Agency) and DCAA (Defense Contract Audit Agency) have co-responsibility for assessing the adequacy of six business systems; accounting, estimating, material management, purchasing, property management, and EVMS. DCAA is responsible for the first three and DCMA is responsible for the last three. There are changes making their way through the regulatory process that would require contractors to hire outside CPA firms to take over the systems that DCAA currently audits (i.e. accounting, estimating, and material management). You can read more about the proposed regulations here). So now, we have DCAA auditors and DCMA "functional specialists" running around performing reviews of Contract Business Systems (or CBSs to use the Government parlance). Sometimes these reviews result in no deficiencies and the contracting officer can recommend approval of a system. Other times however, deficiencies are disclosed and the contracting officer makes a recommendation to disapprove a system. There are varying degrees of deficiencies but only "significant" deficiencies rise to the level where a contracting officer can disapprove a system or potentially withhold funds. A significant deficiency is a shortcoming that materially affects the ability of Government officials and the contractor to rely upon information produced by the system. the proposed final determination.but other times, deficiencies are identified. To provide a perspective on how often auditors and functional specialists are convincing contracting officers to make inadequacy determinations, since its inception, the CBS Advisory Panel has convened 121 times, 65 times for cases originated by DCAA and 54 times for cases originating from DCMA functional specialists. Of the 121 panels, 48 or almost 40 percent related to accounting system deficiencies. Surprisingly (to us) the next highest frequency related to contractor systems used to track Government property. Of the 121 CBS Advisory Panels convened, 109 resulted in concurrence with the contracting officer's proposed system disapproval. 73 of those are currently in a disapproved state while 36 have moved to an approved status following remediation actions to achieve compliance. Statistics concerning the number of cases where funds were withheld from contractors are not available although we do know of several cases where that occurred. See, for example, here. Here's an alert for contractors holding T&M (Time and Material) or Labor-Hour contracts. Under these types of contracts, the Government is contracting for individuals with specific skills and qualifications. It doesn't matter whether someone without the requisite qualifications can do the job as well or better than someone with those skills - the Government expects its contractors to adhere to the terms of their contracts. If you have a T&M contract, you're going to be audited. T&M contracts are subject to final audit.And the auditor is going to perform two basic steps. First, they are going to trace the hours billed back to timesheets or some other form of timekeeping record. Secondly, they are going to check to see if the work was performed by employees who possess the requisite qualifications. So, for example, if the Government contracted for a senior engineer with a bachelor's degree in industrial technology and at least ten years of relevant experience, you can bet that the auditor will check to see if the employee billed under that category has those qualifications. We've written about this before. See here and here, for example. contracts. Its a relatively simple audit step for contract auditors and usually, contractors have to scurry around to prove the qualifications (the scurrying around points to a different issue, one concerning the availability and sufficiency of supporting documentation). ... from Jan 1, 2003 to Dec. 31, 2012, (the contractor billed the Government) for work performed by individuals whose job qualifications did not meet all the qualifications prescribed by the contracts for the labor categories under which their efforts were billed, thereby falsely increasing the amount of money (the contractor) claimed and (the Government) paid. This case was initiated by a routine DCAA audit of incurred costs. It should be a wake-up call for contractors tempted to do the same thing. Don't do it. It's "low-hanging" fruit for a contract auditor. The U.S. Department of of Veterans Affairs took the unusual step of issuing a press release announcing the removal of one of its executives. Usually these matters are accomplished with little fanfare and the disgraced individuals slip quietly out of the limelight. Without naming names, the press release stated that allegations of conduct prejudicial to the Government by the Deputy Chief Procurement Officer (DCPO), Veterans Health Administration Procurement & Logistics Office, were substantiated by the VA's Inspector General's Office. You can read the entire press release here. Susan Taylor, the culprit in this case, was found to have committed several ethics violations. She pressured contracting staff under her authority to give preference to and award a task order for reverse auction services to a particular vendor. She also engaged in a conflict of interest when she improperly acted as an agent of that vendor in matters before the government. She improperly disclosed non-public VA information to unauthorized persons, misused her position and VA resources for private gain, and engaged in a prohibited personnel practice when she recommended that a senior executive service employee be removed from the SES (Senior Executive Service) during her probation period. You can read all the sordid details in the IG report if you care to wade through the 82 page report. This lady would be one hard boss to work for, that's for sure. Rep Jeff Miller, R-Fla, Chairman of the House Veterans Affairs Committee was reported as saying "What I don't want to see happen is for Taylor to retire, resign or find another government job outside of VA without consequence - a pattern that has been emerging in recent weeks. The only way the department can regain the trust of veterans and taxpayers is if VA employees who preside over malfeasance and mismanagement are held accountable, and its up to the department leaders to make sure that happens." After a statement like that, it seems unlikely that she will reappear in any capacity as a Government employee. Want to Show Your Appreciation to a Government Employee With a Small Gift? The Government has a set of ethical standards that it expects its employees to adhere to. Government contractors, at least those with a $5 million contract that extends more than four months, are required to implement business ethics and compliance programs.We would take it a step further and suggest that every Government contractor have one, regardless of their sales volume. We were recently reminded of this as we were reading an article about a Government whistleblower who alerted the authorities to the fact that another employee (a contracting officer) was receiving some pretty nice gifts from a contractor. This alleged gifting occurred overseas where sometimes, cultural norms conflict with the ethical standards expected of Government employees. Nevertheless, Government employees are bound by Standards of Conduct for Employees of the Executive Branch, not by the cultural norms of the country they happen to interacting in some fashion. The Office of Government Ethics (OGE) published the Standards of Ethical Conduct for Employees of the Executive Branch in 1992 (codified in 5 CFR Part 2635). It sets forth a series of overarching principles of ethical conduct and instructs employees to apply them when considering situations not specifically addressed by regulations. It also, for situations that involve appearances of conflicts, provides that the circumstances be judged from the perspective of a reasonable person with knowledge of the relevant facts. Subpart B prohibits Government employees from soliciting or accepting gifts from prohibited sources or gifts given because of their official position. The term "prohibited source" includes anyone seeking business with or official action by an employee's agency and anyone substantially affected by the performance of the employee's duties. For example, a company bidding for an agency contract or a person seeking an agency grant would be prohibited source of gifts to employees of that agency. The term "gift is defined to include nearly anything of market value. However, it does not include items that clearly are not gifts, such as publicly available discounts and commercial loans and it does not include certain inconsequential items, such as coffee, donuts, greeting cards, and certificates. There are several exceptions to the prohibitions against gifts from outside sources. For example, with some limitations, employees may accept"
Gifts motivated by a family relationship or personal friendship (but caution is advised when it comes to personal friendships. Some agencies will transfer employees to other assignments if there is a family or personal friendship involved). Free attendance at certain widely-attended gatherings, such as conferences and receptions, when the cost of the attendance is borne by the sponsor of the event (this, of course, does not include tickets to sporting events). Government contractors and Government employees can adhere to these gifting standards but it only takes one person, who does not have all the facts but is concerned about appearances to blow the whistle. At that point, all parties are in for a prolonged investigation, most likely by an IG (Inspector General) organization that will cost plenty of resources. Our advice, just avoid gifting altogether. FAR 52.216-7 requires all contractors with flexibly-priced (e.g. cost reimbursable) contracts to submit annual incurred cost submissions. The content of these submission are arrayed in a series of alphabetical schedules from 'A to 'O. Schedule L of the annual incurred cost submission is a reconciliation of labor payroll per the IRS Form 941 to the labor cost distribution records. The IRS 941 is submitted quarterly to the IRS and includes such totals as taxable wages, social security wages, and medicare wages paid during the quarter. By adding four quarters, you can determine the amounts paid during the year. Also, the sum of these four quarters should reconcile directly with the sum of employee W-2s that are handed out after the end of each calendar year. The 941s are prepared on a cash basis. In other words, it reports on amounts actually paid to employees during the year. Contractor accounting records are prepared (or should be prepared) on an accrual basis. Therefore, labor per the accounting records will not agree with the 941s. For example, if your payroll date falls on the Wednesday after the end of the payroll period and the payroll period ended December 31st, you would need to accrue those payroll costs into the prior year. But, since the employee did not receive payment in the prior year, the amount will not be included in the 941 for the prior year. So, as part of the reconciliation, you will need to adjust the sum of the 941s for beginning and ending accruals. Sometimes, contractors try to reconcile to the wrong line on the 941s. Line 1 is taxable income. But taxable income will exclude employee contributions to 401(k) plans so that is not a good line to reconcile to. Line 5a shows taxable social security wages. However, taxable social security wages is capped at $117,000 (for calendar year 2014) so that is not a good line to reconcile to. Line 5c shows taxable medicare wages which is not capped so it represents the best amount to begin the reconciliation. However, even this number is not "pure" because, for example, it does not include employee contributions to Sec. 125 Cafeteria Plans. The Schedule L reconciliation is often one of the most difficult and time consuming schedules to prepare. It requires a team comprised of someone intimately familiar with accounting and someone intimately familiar with payroll. For companies that outsource their payroll, the reconciliation often requires the assistance of an account manager for the payroll service. We've seen cases where contractors will come close to reconciling, give up in frustration, and submit their incurred cost submission with an un-reconciled difference. This is somewhat risky because some auditors, when preforming "adequacy" determinations, will reject them out of hand and return it to the contractor. We've also seen cases where auditors will accept an unreconciled difference. So, one never knows. The 2015 National Defense Authorization Act (NDAA) is scheduled to be acted upon during the "lame duck" session of Congress beginning November 11th. The House has already passed a version, the Senate is considering a version and the two Chambers will need to meet and iron out any differences. Costs incurred by a contractor in connection with a congressional investigation or inquiry into an issue that is the subject matter of a proceeding resulting in a disposition as described in subsection (k)(2). It is well established that costs related to dispositions of the above proceedings are unallowable. This new provision would disallow preparation, travel, and related costs when Congress hauls a contractor before a committee to explain the dirty deeds to whoever watches CSPAN and CSPAN2. Schedule M of the annual incurred cost submissions required of contractors holding flexibly priced contracts is a "Listing of decisions/agreements/approvals and description of accounting/organizational changes" See FAR 52.216-7(d)(2)(iii)(M). DCAA's adequacy checklist for incurred cost proposals contains the following items relative to Schedule M.
Ensure completion of this schedule. Note here that DCAA has added the second bullet - negative responses are required. That is not a requirement of the referenced FAR and should not be a criteria for determining the adequacy of a submission. Nevertheless, if a contractor has not made any accounting or organizational changes during the year, it really takes no time to state that fact in a Schedule M. We recommend contractors do so and include negative responses, where appropriate, in submissions we prepare on behalf of clients. The purpose of this requirement is to help identify changes in cost accounting practices that might affect how costs are accumulated and allocated to Government contracts. For example, moving a department from an overhead pool to a G&A pool will affect both rates. Adding a material handling rate where there was none previously, will most likely affect multiple rates. Certainly, acquiring another company or selling off part of an existing company will affect rates. The Government auditors need to know these things in order to effectively and efficiently conduct its audit. Its likely that such events will be identified during the audit anyway so its better that the information be provided up-front. A number of years ago, we discussed the Minimum Annual Audit Requirements (MAARs) that contract auditors need to satisfy in each and every incurred cost audit that they perform. MAAR #7 requires that auditors evaluate any identified significant changes in practices for charging direct/indirect costs for consistency with generally accepted accounting principles, the applicable cost principles per contracts, and any applicable CAS requirements. The purpose of this requirement is to verify that changes in charging do not have the effect of improperly shifting costs among cost objectives, circumventing cost targets or ceilings of certain contracts, or other significant cost categories. Schedule M from the annual incurred cost submission will help the auditor accomplish its MAAR #7 audit requirements.